A famous, if somewhat illusive, woman in the story of Pre-Raphaelite art is the housekeeper at Red Lion Square, Mrs Mary Nicholson, better known as Red Lion Mary. She was the housekeeper for young Edward Burne-Jones and William Morris, after they had moved into Rossetti's old rooms in Red Lion Square (hence her name). There are many stories coming from the few scant years the young men stayed at Red Lion Square, where Mary is the star, which makes it surprising that we do not know more about her. She acted as secretary to Burne-Jones, needlework assistant to Morris, bodyguard to Rossetti and hostess to many young artists. It is said that she would spread mattresses over the floor to accomodate the extra young men who arrived, and when she ran out of mattresses, she'd make beds from boots and portmanteaux. It is through Georgiana Burne-Jones' Memorials of her husband that we have a great deal of the tales of this time and it is obvious she felt affection towards the young woman who looked after Morris and Burne-Jones so completely. I also find it slightly odd how dismissive Burne-Jones can sometimes be about Mary, referring to what he felt lacked in her appearance, but it might just be what we have of his comments, which is an incomplete picture. Starting with Burne-Jones, Georgiana recorded how he would summon Mary and request "quarts of hot coffee, pyramids of toast, and multitudinous quantities of milk", all of which she apparently supplied. She sat and took down letters dictated to her by Burne-Jones in a 'good hand', and she happily suffered lectures on the leather trousers of old Italian painters, when G F Watts sent him a pair of trousers round with some drapery as a joke. Mary would also read from Reynold's Newspaper to the artist on a Sunday morning whilst he worked. He trusted her to keep the key to his music box that he liked to have under his pillow as he slept. She sewed well, showing a talent for making the costumes for the models, as well as more intricate work. It was while she was fixing some drapery, Burne-Jones asked "Why were you made so short?" complaining that he could get on better with her acting as a model on top of all her other roles, if only she was taller. The ever-helpful Mary offered to stand on a stool, which touched Rossetti so much that he used her in his art, height not actually being an issue for him, obviously. 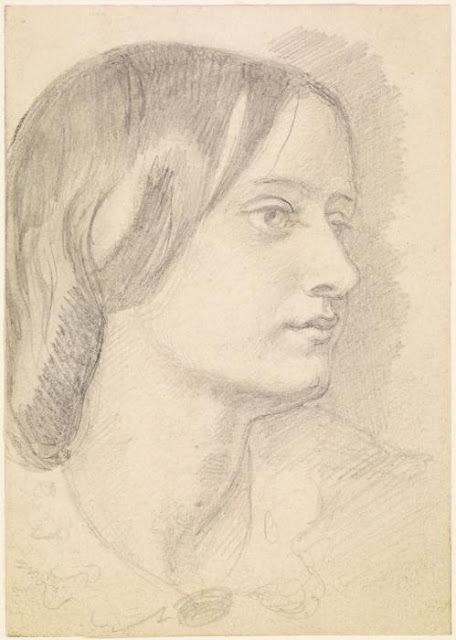 Rossetti did the portrait sketch of Mary at the top, Georgiana Burne-Jones wrote, in honour of her marriage, but as she was already Mrs Nicholson when she took over the housekeeping of Red Lion Square, this seems doubtful unless her title of 'Mrs Nicholson' was bestowed in people's reminiscences. Rossetti called upon Mary to 'smash' a troublesome tradesman - "Dear Mary," wrote Rossetti, "please go and smash a brute in Red Lion passage to-morrow. He had to send a big book, a scrapbook to Master Crab, 34 Westbourne place, Easton Square, and he hasn't done it. I don't know his name but his shop is dirty and full of account books. This book was ordered ten days ago, and was paid for; so sit on him hard tomorrow, and dig a fork into his eye, as I can't come that way to murder him myself." One particular charming anecdote runs as follows: Mary entered a room where Rossetti was working on a translation of an Oriental legend in verse for Thoby Prinsep which he kept repeating out loud. He turned to her and declared "Mary! Shall the hide of fierce lion be stretched on a frame of wood for a daughter's foot to lie on, stained with her father's blood?" Without missing a beat, Mary replied "It shall if you like, Sir." Rossetti was delighted by this answer - "That's a most remarkable girl, Ned," said Rossetti afterwards, "not one woman in ten would have given an intelligent answer like that to a question." It was Red Lion Mary who took Georgiana Burne-Jones to Chatham Place on the morning of Elizabeth Siddal's death when Ned was too ill to accompany her, and Mary offered to go and work as housekeeper for the widowed Rossetti, as by that time her 'boys', Morris and Burne-Jones, were married with children of their own. Of course, Rossetti had Fanny, who Mary seemed to know well. In a letter of 1863, Rossetti wrote that he would soon pay Mary the money he owed and that Fanny would be writing soon. Both he and Fanny sent their best wishes for her ill health and Rossetti promises that as soon as she is better, he would need Mary to sort out some tapestries for him. He also sent a curtain and bell pull for her ministrations, with all good wishes for her improved health. The most fascinating relationship for me is Mary and William Morris. 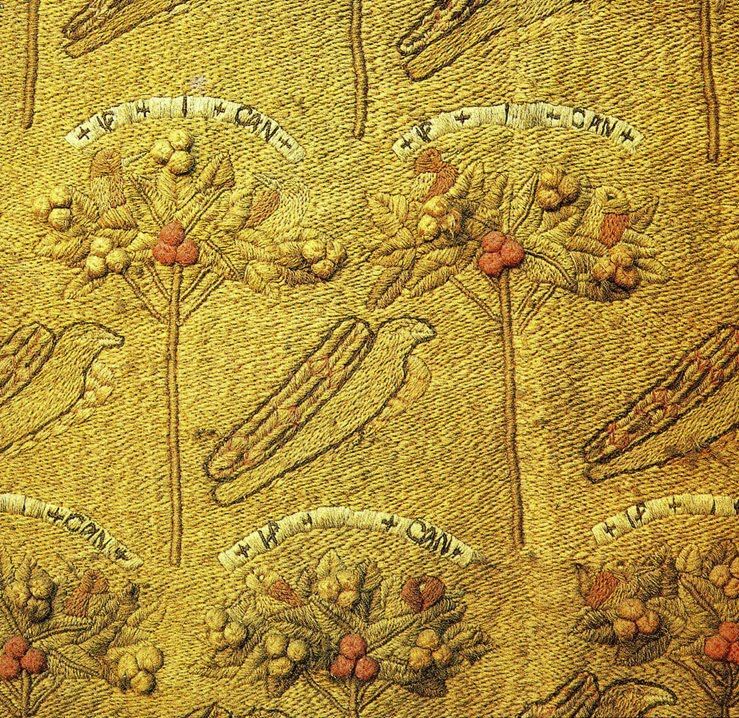 Mary was taught to embroider by Morris, and she carried out his detailed designs, stitching in his studio so he could supervise. Like Rossetti, Morris saw no barrier for Mary to model and there she is behind a fence in the corner of the garden scene. She was absolutely a match for the fiery Morris who would storm and rage at her. One morning after breakfast Morris came out on the landing and bellowed "Mary, those six eggs were bad. I've eaten them, but don't let it occur again." He liked to eat a large lunch of roast beef and a plum pudding and when Mary served him a pudding that was merely the size of a tea cup, he threw it at her. Morris was so intense in his work that any noise Mary made was treated with sharp rebuke, commanding her to stop making 'insufferable noise'. 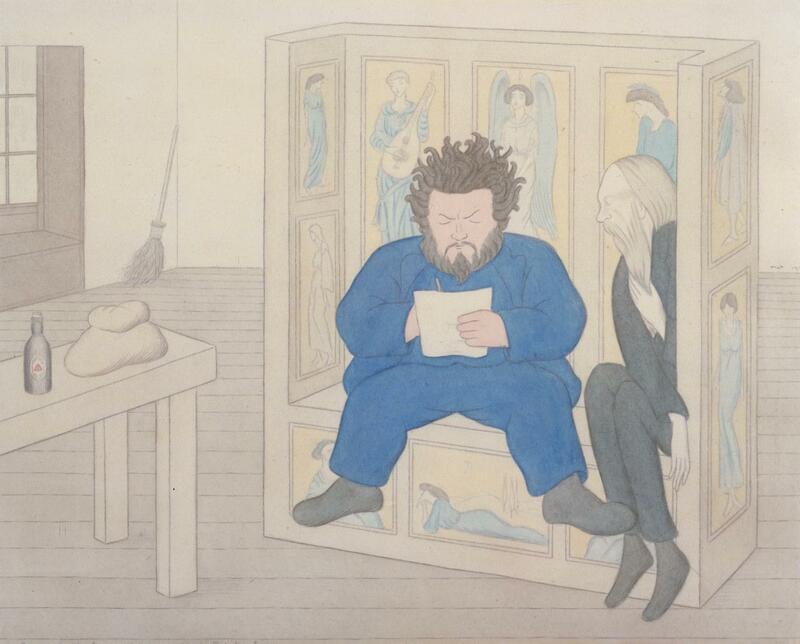 Burne-Jones thought that the problem between the pair was because she preferred Rossetti and himself, whom she doted on, to Morris who always got the coldest water and least clean bed and linen. 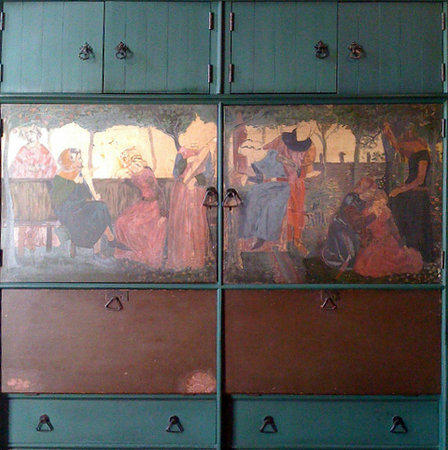 Another conversation Burne-Jones relayed was that Mary stated that she didn't think Morris had a lot of experience with women because 'he was such a bear with them'. So who was Red Lion Mary really? That is a tricky question as although there are hints in the newspapers of the early twentieth century, it doesn't seem that many people have bothered to ask. In the confines of Blogvent I only have today to write this post but I have a suggestion of who she might be. It was reported that an artist called Swan took over the lodgings and Mary in Red Lion Square after the Burne-Jones and Morris weddings. 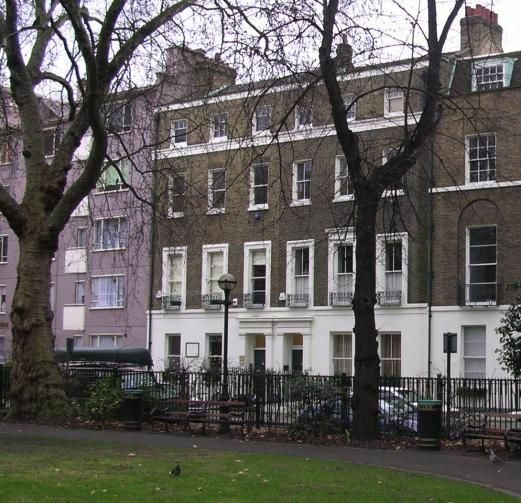 In the 1861 census, Joseph Swan had moved into rooms at 17 Red Lion Square, but no Mary lived in the same building. Within Red Lion Square, there are a number of Marys - Hogan, Whittaker and McCoy - but none of them seem to end up as Mrs Nicholson. There is a Mary Powell however, living within walking distance who marries John Nicholson, has two children but is widowed quickly by the beginning of the 1860s. She is a seamstress, a cloak maker like her mother but by the 1861 census is listed as a 'lodging housekeeper', but only has one lodger herself. I wondered if she was a housekeeper at a lodging-house away from her own home. Her lodger, who seems to remain with her for over a decade is a linen draper, so her life remains filled with fabric. She also has a maid called Caroline Scurry, which is such a Dickensian name for a servant. There is no easy way to prove that this woman is Red Lion Mary, especially not from behind my computer screen, but she seems a likely candidate with what we know of Mary. This Mary Nicholson had a long life, dying in 1923.